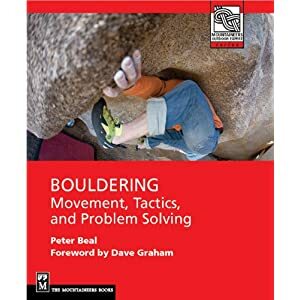 Anyone interested in the quest for absolute difficulty on rock knows of a few standout examples of routes that stand on the edge between bouldering and roped climbing and marked a significant step in the development of the sport, locally or internationally. Action Direct and The Fly are two names that come to mind but the gold standard for this kind of route will always be, for me anyway, Ben Moon's Hubble at Raven Tor, Derbyshire UK. I well remember the photos that came out after its ascent, showing a dreadlocked Moon in extremis on the underclings of the crux. In todays Internet video universe, such a route should have tons of footage widely available yet except for a very brief snippet at the end of One Summer, no film of the route has been widely available. Perhaps this is due to a genuine dearth of repeats. It can't be because of accessibility as you could practically film it from a car on the road next to the cliff. Anyway, Steve McClure, who has climbed many 9as in Great Britain, came in for the sixth ascent which might not be big news except that the route was first done in 1990. Can this route really be merely 14c? Go here for a follow-up from UK Climbing. Okay, Ben, Malc, Rich Simpson, and now Mr McClure, who's the other two?